'Ekvera'. Coloured aquatint by Thomas Daniell after James Wales. Plate 6 of [Antiquities of India], published by T Daniell, London, 1803.
bl.uk > Online Gallery Home	> Online exhibitions	> Asia, Pacific and Africa Collections	> 'Ekvera'. Coloured aquatint by Thomas Daniell after James Wales. Plate 6 of [Antiquities of India], published by T Daniell, London, 1803. 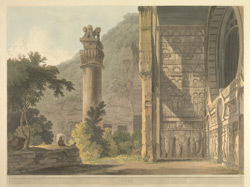 Coloured aquatint by Thomas Daniell after the drawing by James Wales, published by T. Daniell in London in 1803, of the cave temple of Ekvera (Karli) in Maharashtra. The artist James Wales visited Karli, once known as 'Ekvera', in December 1792. It was after his death in 1795 that his friend Thomas Daniell published the drawings of the rock-cut temples of Western India that he had done between 1791 and 1795. This aquatint depicts the side of the great cave temple of Karli, at the top of the Western Ghats near Bombay. This chaitya or assembly hall was excavated during the phase of early rock-cut architectural activity in India in the 1st century AD. The cave is preceded by a courtyard and a huge 'simhastambha', a column with a bell shaped capital topped by four lions stands near the entrance. The facade of the cave has a wide horseshoe-shaped window. The porch is adorned with very fine carvings depicting mithunas or amorous couples positioned between the three arched doorways. A row of life-size elephants, seen in this aquatint, is carved on the side of the porch.